Elite tuning questions - VE tuning is that the best option? Well, looks like I got my hands on a 1500 this morning. I'm migrating from the haltech E8. Now running 13B RE, FFE crank trigger, will get a WB1, ID injectors, DBW throttle body and pedal, , Fuel flex & the 1500. Or should I just migrate over all my old tune into the 1500 and use that as the starting point? Or is VE tuning completely different? Sorry about the stupid question, ive not seen much about it so keen to read up and learn more. Sorry to follow on from this. Is the haltech auto adjusting fuel tables really just the same as VE tuning? curious to know whats the difference? The ultimate difference between VE and pulse width tuning is going to be zero, if the tuner is capable and knows what they're doing. In the end, each individual cell needs to be calibrated, regardless of the method employed. Some in the community have insinuated or flat out falsely claimed that VE is somehow superior and can produce more power and/or better driveability. That's simply not true. Some of the best ECUs in the world still use pulse width tuning. If VE had a real end game advantage, those manufacturers would use it. The two big advantages of VE are that it gets you in the ballpark for initial start up MUCH more easily and injector staging has largely been automated. Once the engine is up and running and tuning process has begun, there is little advantage to the VE method. That said, you'll want to start fresh with a new calibration. Any latency differences in the firmware and drivers will show up as calibration issues you'll want to address. Since you're starting over, I'd use VE for the automated staging alone. It works an absolute treat. Long term fuel trims can be used with either VE or pulse width methods. So no worries there. I think as I tend to use my car for a number of different applications (Cruising, track day, drag) its really 90% of the time cruising and been a spirited weekend car. So getting the most out of the transient (short) term fuel cases is probably the most important thing for me. In regards the "new calbriation" I'm assuming your talking about using just the haltech base map fresh and go from there? dont worry about migrating over to much of my old tune? Really just set up the sensors and new triggers etc and go from there correct? I wouldn't migrate anything over. Like I said, it's likely the values wouldn't translate well anyway. The default VE table should get you started but email Haltech, they have a real good rotary VE map. It's just not included with the software. 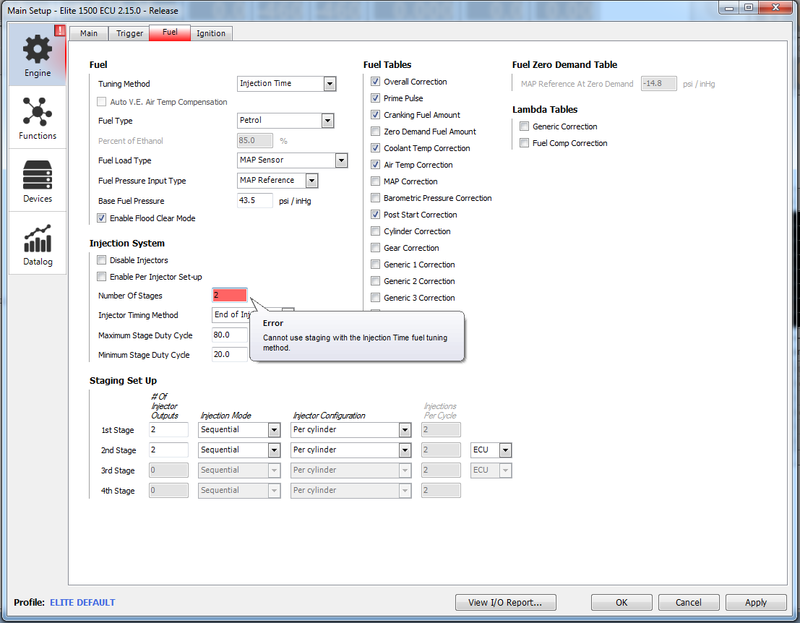 All you need in addition is to enter the correct values for your injectors. It's my understanding that Injection Time tuning method on the Elite series does not support staged injection, only VE tuning does. Correct. Forgot about that. Another reason to use VE. Cool, sent them an email and will go from there. It is curious why they don't include a VE map as a base line or make it available for online download. I planned on doing VE because was going to use 3 stages of injection (6 injectors). If you get the base map from haltech I think posting it for the community would be of benefit. I'm curious how your DBW setup turns out as I'm also doing that with the FFE adapter and 90mm. Cool got the file today, will have a look it and post up some images for others reference. Hmm whats the best way to share excell files and the like on Rx7club. Just made a file with all the snap shots and data from the Haltech original file. You can just zip the map and post it. May be able to do the same with an excel file. In for answers and posts to come. Last edited by Skeese; 08-24-16 at 08:04 AM. 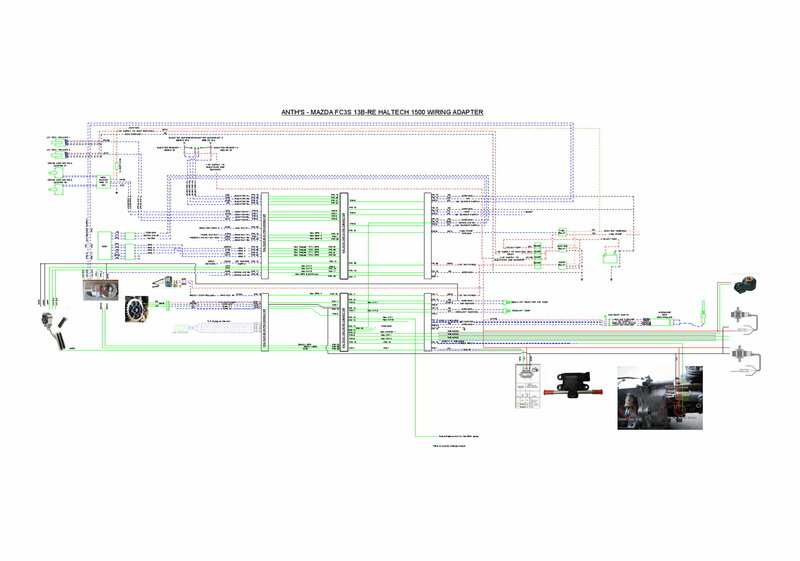 The Rx7 map from Hatech for the 2500 ECU. My Draft Rx7 haltech 1500 ECU map. So basically I got the map from Haltech and looks really good, much more developed then their original base map for the 13B. I then copied and screen shot all the maps to put them into excel file so i could copy the info into a new 13B map for the 1500 ECU. From that point I starter modifying to suit my setup. Anyway ECU is in, just need to start the repinning process. Looks easier than I originally throught. 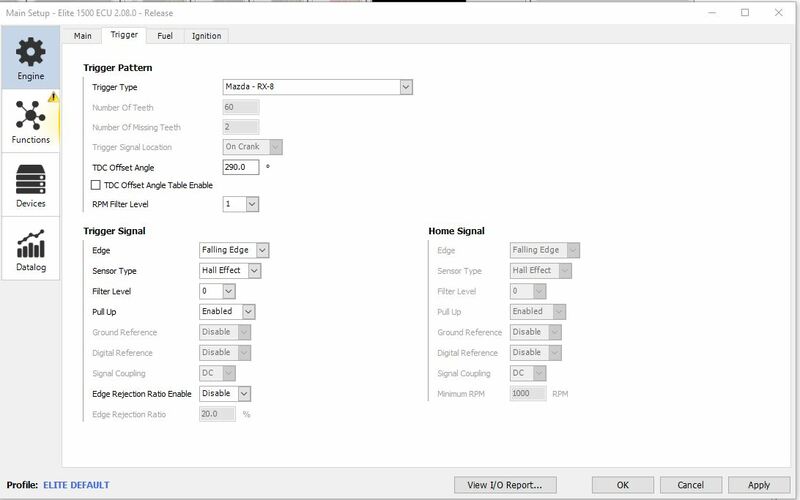 Injector settings are here. Enter the flow for your key on, engine off fuel pressure and then the corresponding dead times for that same pressure. ID injectors will all be high impedance. Those are the only 3 parameters you need to worry about. FWIW, you don't have to manually import the cal file from the 2500 to the 1500. There is an import map function that works great. Make sure pin A26 gets switched 12V. That's about the only gotcha when converting from the older E-series or Sport ECUs. Without it, the ECU will not function. Skeese, I think they saw the light with VE and how much easier it is for novices to get the fueling in the ballpark and get the engine started. The automated injector staging also works like a charm and, again, makes the process so much easier for novices. Avoiding the tech support that pulse width tuning a staged map creates was probably enough of an incentive for Haltech to not spend the time to write the firmware to support that function. In the end, for someone that knows how to calibrate a fuel map, it's really 6 of one and half a dozen of the other. Neither method will produce better results as an end product. VE is just easier to get up and going since it models engine airflow independent of injector characteristics. 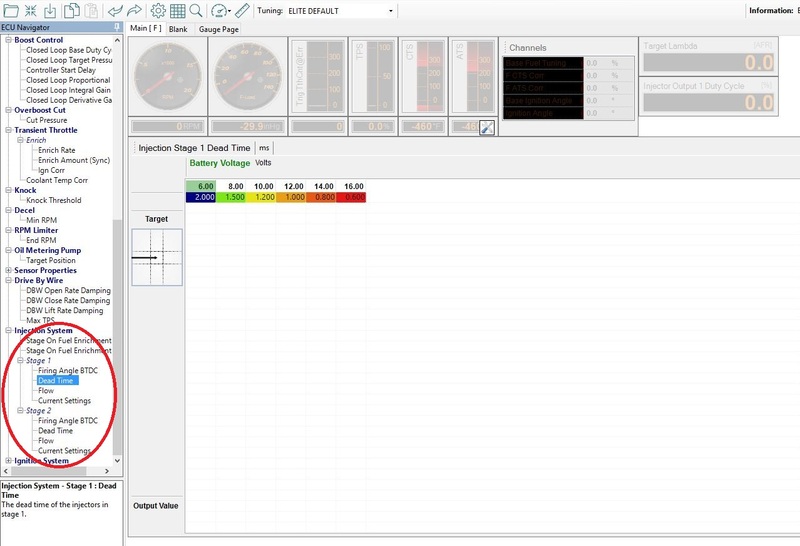 Some of the best motorsports level ECUs still use pulse width mode exclusively. Last edited by C. Ludwig; 08-25-16 at 03:47 AM. Well that might explain why I didn't have any luck swapping a ps1k out for an elite 1500. How to upgrade from Sport to Elite. Cool well got some of the new wiring done. Just need to find plug ends for the new pedal, and some new sheilded sendor wires. Will buy the WBC1 today. We use broadband knock sensors form a Nissan application. Cheers for the heads up on the sensor. So... getting closer. But am I missing something? I got the WC1 wideband controller. And the CAN plug doesn't fit the elite? are there different CAN plugs on the ecu's? Also what the bets way to mount the WC1? Will get some images up soon. They changed the plug. They've been asked to either include both cables or stock an Elite and Sport version but haven't done either. Here are instructions on changing the connector to the Deutsch DTM included with the ECU. Quick Reply: Elite tuning questions - VE tuning is that the best option?